I have been wanting to make a car window sticker for awhile now for team Shannonigans. The time is finally here thanks to 2 of my fabulous friends! They were able to make my vision come to life! The stickers are $10 each. They come in PURPLE or WHITE. 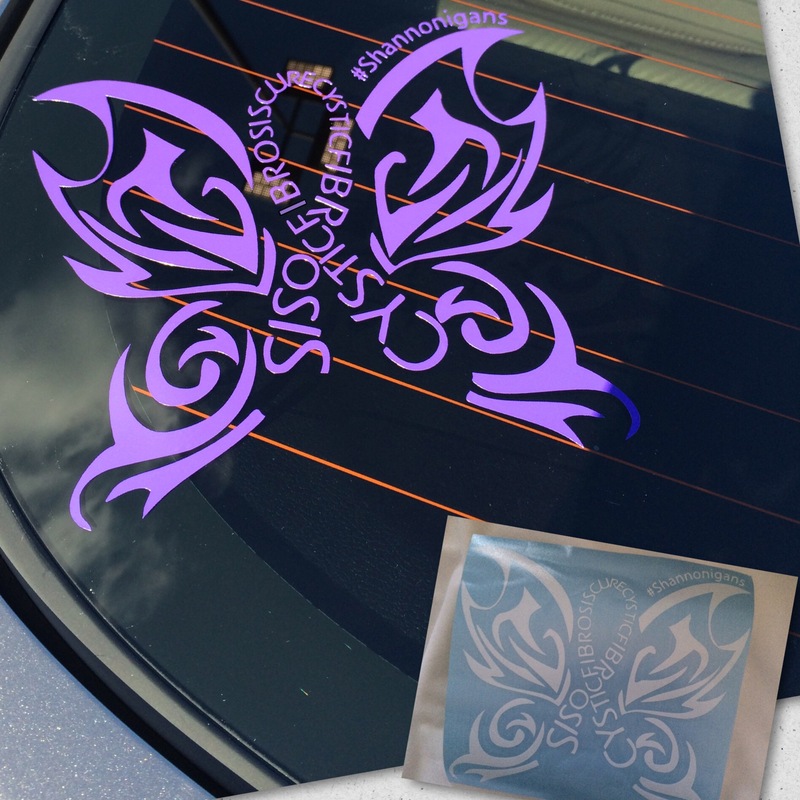 The design comes from the back of the Shannonigans shirts with the ribbon modified to say CYSTIC FIBROSIS CURE CYSTIC FIBROSIS and a little Shannonigans hashtag love. I love them!! The butterfly and ribbon design is actually from the big tattoo on my back. My tattoo has “Never Give Up” over the top. So you all have a part of me. There is real meaning behind the design. The funds raised from the sales of the stickers will go to an account for future medical expenses. A lung transplant will be in my future at some point and we want to be ahead of the game when the time comes. My husband will have to take time off work to care for me at that point. Also depending on where I am listed for transplant we may have to relocate for a short or extended period to be close to the hospital I am listed at. It is uncharted territory for sure but we want to be as prepared as possible. You can pay for your stickers through PayPal using the “send friends money” option and my email, LTLHOOK@yahoo.com, as the recipient. If you would rather send a check, please email me for my mailing address. Local Tennessee folks can give cash.